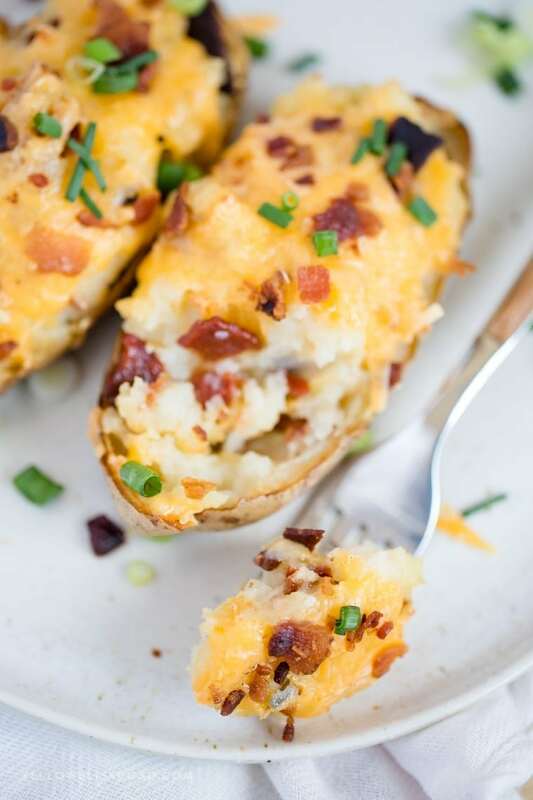 These Cheesy Bacon Stuffed Twice Baked Potatoes are stuffed to the brim with tender potatoes, cheddar and Parmesan cheese and lots and lots of bacon. 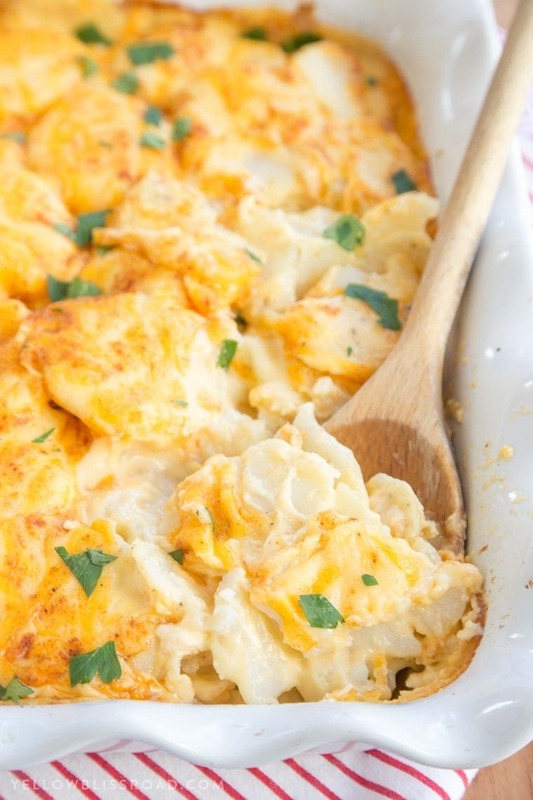 They are a great side dish for any holiday! 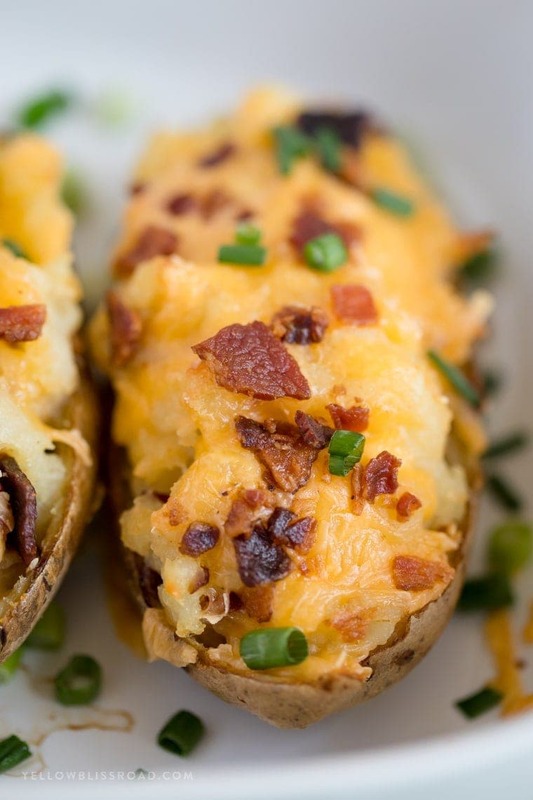 If my dad’s claim to fame is his classic meatloaf recipe, then my mom’s is this twice baked potato recipe. It’s a little different because we don’t add any sour cream or milk to the mix like the other recipes I’ve seen. That would pretty much make them mashed potatoes and that’s not what we want. Just mashing to potatoes slightly and leaving out any extra liquid helps the potato flavor really shine through which is why we love them! This recipe is definitely a classic, and something we enjoyed with every Christmas and Easter dinner. I’m not sure why they were generally reserved for special occasions, but I think it’s time we break that tradition. 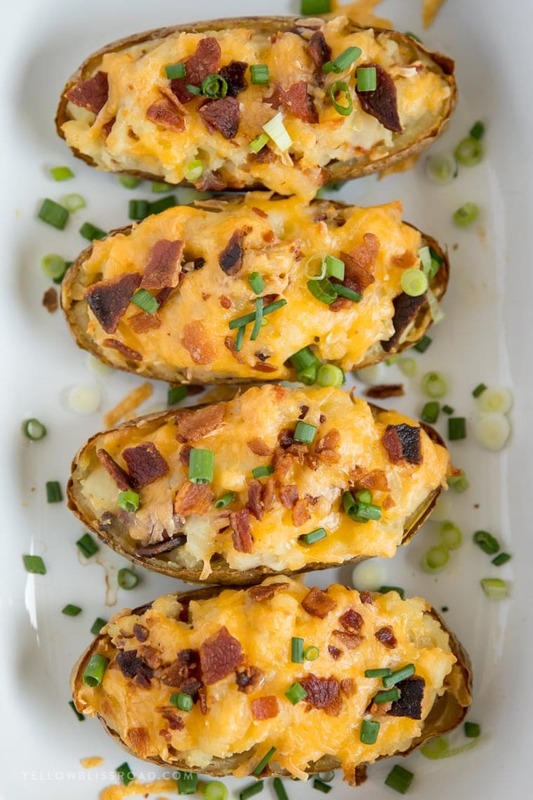 I plan to be adding these delicious cheese and bacon stuffed potatoes to a whole slew of meals from here on out! 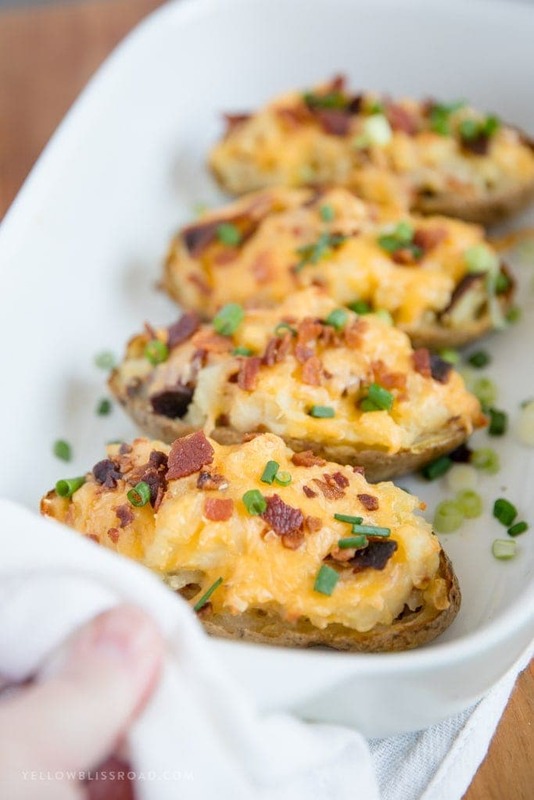 The first step in making twice baked potatoes is the first round of baking. This can be done in the oven for an hour or so or in the microwave. I usually opt for the microwave because it’s so much faster. Scrub the potatoes with a clean sponge to remove any dirt, then pierce them several times with a fork. Bake them in the microwave for about 4 minutes per potato. If your microwave has a “potato” button, use that. Once the potatoes are cooked through, you’ll want to let them cool for a bit until they are cool enough to handle. They get really hot, so be cautious! Slice them in half lengthwise and gently scoop out the flesh, leaving about a small rim of potato around the shell for support. Then comes my favorite part – adding the cheese and bacon! I like to add lots of it – but it never quite seems like there’s enough! The green onions you can add into the potato mixture or just on top after they’re baked. I like to have them sprinkled through-out the potato. Finally it’s time to bake again! Bake them for about half an hour or until they are heated through and the cheeses are melted and a little golden on top. 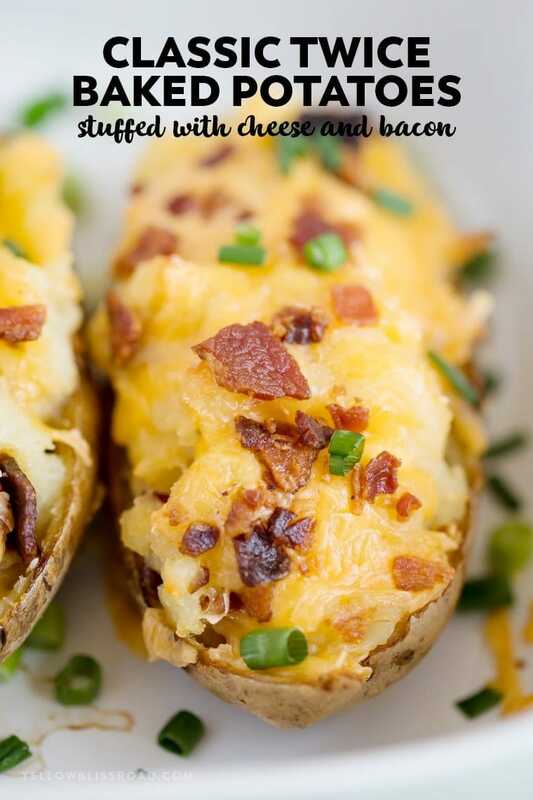 You can also refrigerate the stuffed potatoes for up to a day prior to baking which makes them great a great make-ahead Thanksgiving side dish! Bake potatoes in 350˚ oven for 60 minutes. While potatoes are baking cook bacon until crisp. Cool potatoes about 10 minutes and slice in half. Carefully scoop out the inside of each half into a mixing bowl. Leave a small amount of potato on the skin. To your bowl add butter and lightly mash. Add crumbled bacon, parmesan and ½ cup of cheddar. Lightly mix ingredients together. 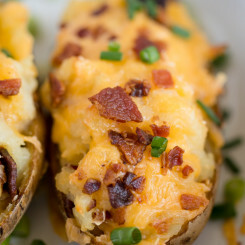 Spoon potato mixture back into the potato skins. (You may have some skins left over.) Top with remaining cheddar cheese. If you don't plan to bake right away, cover and refrigerate overnight. Bake at 350˚ until cheese melts, about 20 minutes. You don’t have to eat the skin.